I have a theory. During a biblical lifespan of three score years and ten, you probably fall across a special album as many times as you fall in love. Maybe two, maybe three times? Well my latest love affair came courtesy of the Tom Robinson radio show on BBC 6 Music. He played "Johnathan," the opening track from the solo album by Londoner Al Joshua, Out of the Blue. As they say, that was that- it became a that track I've played over and over again, and with each listen, I heard a different take on this wonderful expressive song played out in story format. The scene is set when an unknown soul is viewed across a foggy evening river. The Seine, The Thames? A dream of nighttime pursuit, desire, love to be fulfilled, or not. Six minutes of semi spoken-verse with a simple piano accompaniment, balanced by an evocative trumpet and clarinet. The trumpet solo reminiscent of Chet Baker on the 1983 Elvis Costello hit "Shipbuilding." The remaining 11 tracks on the album are just as challenging with skillful arrangement throughout. So with some difficulty I managed to track down the elusive Al Joshua and arranged to meet in what turned out to be a busy early evening pub. I'm sensing its 50/50 if he will actually show up. Back in 2009, Joshua was a member of the indie/rock band Orphans and Vandals. who had acclaimed success with their debut album I Am Alive And You Are Dead. They split in 2010. Then nothing. He went missing. No sightings on any musical radar screen for many, many years. It was 2015 before Joshua resurfaced, writing both script and soundtrack for the film Set the Thames on Fire, starring Sadie Frost, Noel Fielding and Sally Phillips. Then in October 2018, his record label Rare Cut Records released Out of the Blue with 12 songs at 1 hour 30 minutes. Though it was available on most streaming devices, there was no fanfare, no PR blurb, no gig dates, akin to the black monolith in Kubrick's 2001: A Space Odyssey. it just appeared. My doubts on Joshua being a no-show were ill founded. He was on time, friendly, affable soon settling into the pub surroundings and my questions. I begin by asking how long he's been working on the album. "Well some of the songs I've been working on since the breakup of Orphans and Vandals, so ten years. I've been writing throughout this time. Some went towards the soundtrack of Set the Thames on Fire, others made the current album, and others are still work in progress. I wanted to make another album but wasn't sure of the style and content. As I played around with the format, the story and style I wanted to achieve came together." Joshua explains how a chance meeting with an old friend and engineer/producer Tim Hamper was key to progressing his ideas for the album. "I'd worked work with Tim on my previous album collaborations. We came across each other one evening in Soho, began chatting and ended up listening to some of the tracks I was working on. I guess that meeting gave me the focus and in some ways, the confidence to progress with the ideas and structure I wanted to achieve. I didn't want to follow what had gone before with Orphans and Vandals. I wanted something different. Over the years, I taught myself piano chords and wrote some of the songs on piano, as against my usual format of guitar." By my basic math, Joshua is probably in his late thirties, but could easily pass for late twenties. As he becomes more expressive about his ideas, he gesticulates with slight hand movements, aiding the point he's trying to make. He occasionally raises his voice in an effort to be heard against the evening pub chatter. In doing so, his voice breaks, exposing the gruff, rich tones which are a compelling part to many of the albums songs. Since hearing "Jonathan" and the subsequent album, I'm keen to know, where has he been during those intervening years? "Ah good question" Joshua begins a little nervously. "It was the end of many things, one of them being a long-term relationship which hit me hard. The band had split, I ended up without much purpose or direction. When I write about loss on the album, it isn't that someone died. It was just the end of many things. I ended up retreating into my own world" he says pausing to sip his peppermint tea. I ask if there is any significance in drinking tea in a pub? He smiles at the question. "I did plenty enough drinking for a lifetime over those years. Part of getting myself together was giving up the drink." He points at his teacup "Tea is fine for me now"
"I was certainly writing about grief- it takes you to unknown places dealing with emotions which knock you off your feet. Yes, you could say I was somehow adrift, but I kept on writing- it gave me a routine and daily structure, but for many, many years, I wasn't involved in music of any kind. I missed playing live and the interaction with other musicians. By the way, I never intended for the wilderness years to be so long." he confirms with a smile which conveys that those days are behind him. Not surprisingly, when deciding on when, or how, to start the new album, doubt and a lack of confidence came knocking. "Although I really wanted to work on getting the songs into the studio, I wondered if my time had passed. Could I make new material, new ideas work in the way I'd planned? I had serious reservations. But I thought, if I don't try and do thisknow, then when?" he recalls. When I ask what he wanted from the album, Joshua is very clear. "From the moment the albums beings, through to its conclusion, I wanted a particular world to be created. I also wanted it to be very intimate with one voice speaking to the listener throughout it without it being cluttered, not filled with white noise. I wanted space for the instrumentation with a creation of colours generated by the various instruments." "Love You Madly" probably captures the complexity he trying to achieve- a passionate plea towards a boy named Sam. Clarinet and trumpet intertwine to scene set a cold evening autumnal atmosphere. He's somehow captured a swirling mesh of narrative with instruments replicating his tone and mood, each being allowed its own space. They follow his phrasing with neat timing and collaboration without ever taking over the narrative. Although there are a couple of tracks ("Blue Moon Black River," "Judd Street") which capture the swish and glide of a waltz, the album is built around jazz instrumentation and arrangements. However, Joshua is uneasy placing the album under the category of jazz. "To be honest, I'd place it more as singer-songwriter album than jazz. It would be a huge injustice to real jazz albums to call Out of the Blue a jazz album. I just think it's jazz-influenced." he says with undoubtable sincerity. He does however place a great deal of merit on the album's musicians, namely Mikes Sakelliou (clarinet and mandolin) Bodo Maier (trumpet) Alexander Metcalfe (piano, accordion and string arrangements) who he defines collectively as exceptionally good jazz players. For my part, I think his modesty is clouding the album's true genre. Jazz arrangements with excellent lyrical expression are built into every track. If Out of the Blue is ever released as a hard copy CD records, stores throughout the land will be met with a placement dilemma. Most of the songs are between five and ten minutes long. None of them overstaying their welcome. "Souvenirs" is over 14 minutes and probably a marker around which everything else is set. In a Philip Glass style tempo, Joshua's piano repeats the same note sequences over and over, whilst observations abound regarding London's commuters, headlights and hiding animals. Then, memory takes over of loved shared in a flat lived in long ago, with apartments and dreams still unfulfilled. "Life seems like an endless series of losses" is one of his more poignant lines. Stay with the clarinet solo until it takes you home. "Skinned Alive" takes the listener along a path of dream sequences coupled with hazy memories of travel down rivers, snakes in trees, meeting strangers and vibrant colours, with a constant reminder someone is "falling in love" set against easy strumming of guitar strings. Joshua explains "it's a song which had many changes along the way. I knew what I wanted to say but it took me a while to get there. I feel it's one of the best song I've written." And what does "Skinned Alive" mean I ask? He pauses as though he's trying give a succinct answer which is clear. "It means loving someone. The feeling, the hurt of losing someone special, in its rawest form, like having the skin stripped from your body, hence skinned alive." he confirms taking another sip of tea. 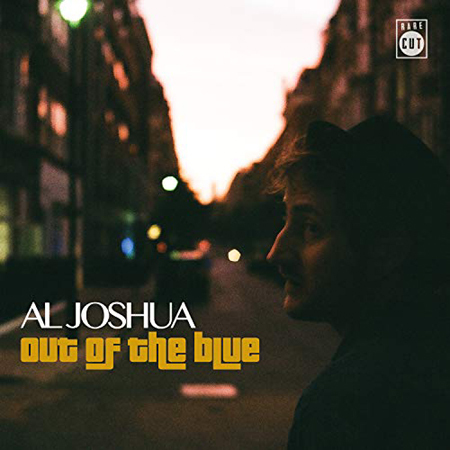 Joshua pays particular note to the likes of Dylan, Tom Wait, Billie Holiday, Serge Gainsbourg, Jacque Brel coupled with lots of French chanson and �40's/'50's classic jazz songwriting for ideas in framing Out of the Blue. "I've listened to them all over the years, so yes, I'm sure some parts of their music have been influential in the albums sound, musically and lyrically." When I've suggested to friends and colleagues that they should give the album a listen, the feedback has been unanimously positive. Other than the Tom Robinson show, where he played the track "Johnathan" every day for a week, I haven't heard any album played anywhere else. So with a lack of air play I ask what's the plan for 2019? "Well, we released the album and wanted to get some reaction before deciding what to do next. I think short term, we would be looking to play small venues around London. At this stage, I see any performances being further away. Maybe an official album release gig. But that would depend on who was available or it could be just me and a guitar." he muses. It's a dilemma for artists and record labels up and down the country- gigs and exposure versus financial outlay. Return on investment, I think those financial types call it. As we leave the pub behind, shake hands, turn up our collars against the evening drizzle. I watch Al Joshua head out into the busy London streets. I ponder what will become of Out of the Blue in 2019. It's a personal, intimate, expressive, thought-provoking body of work. Will it become one the best albums of 2018 you've never heard? I hope not- Joshua and the album deserve recognition.